Welcome to All Saints’ Episcopal Church! All Saints’ Church is a community of people living in Chelmsford, Greater Lowell and beyond who gather to worship God. We cherish the Episcopal tradition. We provide opportunities for members to discover, share and use their gifts, gratefully acknowledging God as the source of all we have. Through Jesus Christ and in unity with the Holy Spirit, we seek renewal and growth as people of faith and as a Christian community as we worship God our Creator, are formed in our faith, and join God in God’s mission of reconciling love, serving both those in this place and those in the world outside our walls. The Book of Common Prayer: This is the red book found in your pew. It contains all the words for the service and the page numbers are listed in your bulletin. The Hymnal: This is the blue book found in your pew. It contains songs for the service and page numbers are listed in your bulletin and on the front boards on either side of the altar. Songs with an “S” before them are service music and are found in the very front of the hymnal. Lift Every Voice and Sing: This is the black and red book found in your pew. Songs are listed in the bulletin and on the front boards as LEVAS or “L” and a number. Communion: Whoever you are, wherever you are on your journey of faith, you are welcome to receive the communion of Christ at All Saints’ Church. If you prefer not to receive, you can come forward for a blessing. If you do choose to receive, you can take just the bread, or bread and wine. Wine can be sipped directly from the chalice or the bread can be dipped into the wine and then consumed. Elevator: There is an elevator that will take you from the Sanctuary down to the classrooms and then on down to the Parish Hall. The directions are taped on the elevator control panel. Large-print Prayer Books: The Book of Common Prayer is available in large print for those with vision impairments. Please see an usher or greeter for assistance. There are two sets of restrooms. One is at the bottom of the stairs from the Narthex. The other is in the connecting link between the main church and the Parish Hall. The connecting link bathrooms are accessible for those in wheelchairs and offer changing tables. Church School: Classes and programs are offered during the regular school year for children beginning in grade Pre-K through 12th grade. Feel free to ask a greeter to take you to the appropriate classroom. Babies & Toddlers: We offer a nursery through the doors directly behind the sanctuary for children who need a place to spend time when they’re having a hard time being quiet in the big church. The service is piped in over a radio frequency so caregivers can follow along. It is run by one paid staff person and a rotation of parent volunteers. Kits for Children: Kits with paper and crayons for children are available from the greeters or ushers in the Narthex. The crayons and paper can be used during the service and returned to the Narthex at the end of church. *The Narthex is space just inside the main entrance. Adult Forums on various topics are offered on a regular basis after the 10:00am Sunday service. Parish Choir – The Parish Choir sings weekly during the school year at the 10:00 a.m. service. Rehearsals are Thursdays at 7:45 p.m. and Sundays at 9:10 a.m.
“B” Sharp Choir – grades 4, 5, and up. This group performs more advanced music (e.g. two or three part music). Rehearsals are Thursdays from 6:30-7:30 p.m.
Disco Penguin Choir – This is typically the children’s first exposure to choral singing, and learning to follow notes and music is a major accomplishment. This group, for grades 1-4 (but able to read words), focuses on unison singing. Rehearsals are Thursdays from 6-7p.m. Handbell Choir – The Handbell Choir plays regularly throughout the year. This group continues to grow in confidence as well as expanding its scope in types of repertoire and technique. Rehearsals are Thursdays at 6:30 p.m. Please refer to our weekly e-bulletin that is available online, to find out about the many social and outreach activities happening around our parish. We invite you to join us! Information Cards: Fill out the cards, including your email address, and the rector will contact you and offer to meet for coffee to hear more of your story and to tell you more about our life in Christ.The cards can be found at the ends of the pews or on the table in the back of the Narthex. Fellowship Hour: If you would like to join others at coffee hour following the 10:00 service, head right down to the Parish Hall or look for a greeter in the Narthex after the service. In the 1850’s, Miss Anna Eliza Hunt wrote to the Rev. Theodore Edson, Rector of Saint Anne’s Church in Lowell about the “enfeebled state of religion” in Chelmsford, and asked him to come to hold Episcopal services. Meanwhile Miss Hunt began a Sunday School for children. Her long term desire was to establish an Episcopal congregation in Chelmsford but she knew that would require many resources, a place to gather being foremost, clergy, and the money needed for the same. She spent the next 50 years methodically gathering the human and capital resources to establish a congregation. She had to rely on others, visiting clergy and generous patrons in order to have official services, to purchase property and build a church. Even so, she spent even more time and energy building a community of faith. She established a church school, organized prayer meetings, and oversaw fellowship events. All of this would grow into All Saints’ Church. It is notable that the founders of All Saints’ chose to locate their church in the center of the town and built a church that was significantly different in appearance from the New England Meeting House architecture of the Unitarian, Baptist and Congregational churches also in the Center. The church the founders built had the permanence of stone and appearance of rural England. The Chapel was begun in 1879 and the small congregation spent the next 13 years struggling to pay for permanent clergy. Nonetheless, the work of raising children in the Episcopal Church and building up the church community continued. Our founding years established a tradition of self-reliance and lay leadership. In 1892 the arrival of the Rev. Wilson Waters, who served as Rector for almost 40 years, solidified All Saints’ Church as a permanent and stable local institution. In the same way, “The Stone Church” became a landmark for all who passed by. “[In the early 1950’s], the parish began to address the fact that their facilities were woefully inadequate. Instead of building a new sanctuary, All Saints’ built the Parish Hall, with a primary concern for serving the children and youth of the town. The gym and stage indeed became a social center. A church basketball league, plays, performances, dinners and other social events helped All Saints’ become a place where people, young and old gathered. In this time, All Saints’ served as the center of many people’s social lives. In 1960 the new sanctuary was built. Strong lay leadership was behind both building projects. We have continued to improve our facility by refurbishing our Parish Hall, adding an elevator and ramps for handicap accessibility, and adding air conditioning. We rely heavily on our volunteer and lay leadership, and we are blessed with many talented members who share their gifts. All Saints’ Church is a Habitat Covenant Church. 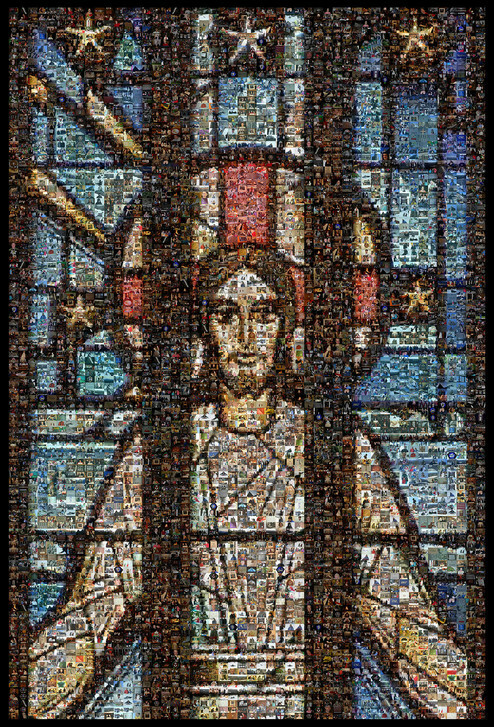 The figure of Jesus on the cover of this brochure is a mosaic of the stained glass window in our sanctuary, comprised of tiny photographs of people engaged in various parish activities. 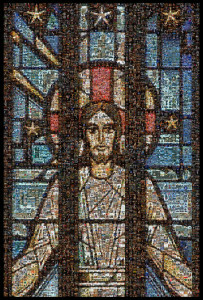 It was created by parishioner Steve Grillo.